Wolves chief executive Jez Moxey says money will be spent on improving the squad this summer but is cautious about their chances of achieving a second successive promotion. Manager Kenny Jackett's side are back in the Championship next season having already secured the League One title. "We'll get some players in, get some players out and start the season with real optimism," he told BBC WM. "But we don't want to put any extra pressure or expectation on our team." Wolves clinched promotion from the third tier in some style, scoring 95 goals so far and stand on the verge of breaking the 100-point barrier with two games left. A club-record run of nine successive wins accelerated Wolves towards the title and have taken 50 out of the last 57 points available. Moxey knows building on that form is key for their assault on the Championship. "We want to keep the momentum going through the summer and into the start of the Championship season," he said. "We want to play with the same gay abandon that we did this season and, with the support of our fans, who knows what we can do?" Before thinking about another promotion and a potential return to the Premier League, Moxey insists their immediate attention has to be focussed on sorting out the squad at Molineux. "We've got a big job to do moving some players out - the players who are already out on loan," he explained. "There's eight or so senior players that will be coming back who we need to talk about and hopefully find new homes for." 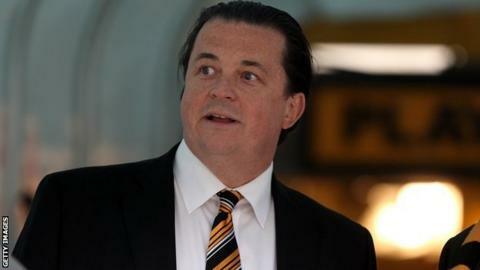 Once that is sorted out, Moxey has no doubt the club and go from strength to strength under Jackett's guidance. "His contribution has been immense," he added. "He's completely reinvigorated the team and changed the squad. "It's been remarkable, he couldn't have done a better job."